getfirebug.com has another great release: Firebug 1.10a8! Firebug 1.10a8 fixes 25 issues. As part of this feature, the Computed side panel also supports tooltips for colors, images and fonts. Extended monitorEventS() API (issue 5406) – it’s possible to specify a group of events that should be monitored. Auto Completion for CSS selectors (issue 5421) – Firebug auto-completes IDs or class names when the users creates a new CSS selectors! 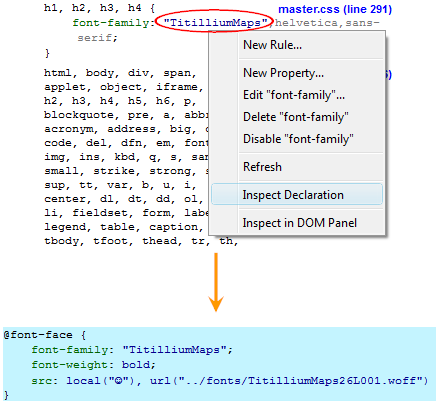 Link between web-font usage and its declaration (issue 5438) – This feature allows to quickly find the place where web-fonts are declared. Thanks to awesome Sebastian Zartner and Simon Lindholm who have done tremendous work on this release! This entry was posted on Friday, May 11th, 2012 at 9:58 am	and is filed under Firebug Releases, Firefox. You can follow any responses to this entry through the RSS 2.0 feed. Both comments and pings are currently closed.